Artist's illustration of two Bigelow Aerospace B330 expandable habitats joined together in Earth orbit. Today (Feb. 20), entrepreneur Robert Bigelow announced the creation of Bigelow Space Operations (BSO), which will manage the private space stations being built by his Nevada-based manufacturing company, Bigelow Aerospace. "We intend to spend millions of dollars this year in drilling down, hopefully, to a conclusion one way or the other as to what the global market is going to look like," Bigelow said in a teleconference with reporters today. "We expect to finish that investigation by the end of this year." 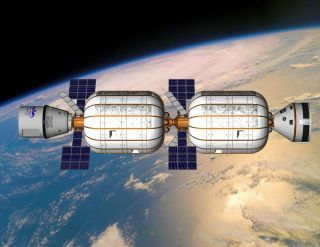 Bigelow's space-station plans are based on soft-bodied modules that launch in a compressed configuration but expand greatly once they reach space. Such inflatables offer much more habitable volume per unit launch mass, and better radiation shielding, compared with traditional aluminum modules, company representatives have stressed. The BEAM provides 565 cubic feet (16 cubic meters) of internal volume. Bigelow's private space stations will center around something much bigger — a module called the B330, which will feature 11,650 cubic feet (330 cubic m) of pressurized volume (hence the name). You'll need deep pockets if you're interested in staying aboard a Bigelow station; prices will likely run in the "low seven figures," Bigelow said today. He doesn't expect tourist jaunts to make up the bulk of his business, however. "What we've always anticipated and expected is that we would be very involved in helping foreign countries to establish their human space programs, and be able to facilitate whatever their needs were in whatever context that they wanted to pursue," he said. "The corporate world, obviously, is huge, and [leveraging] that is also our intent." Bigelow Aerospace is on track to launch its first two B330 modules in 2021, Bigelow said. And in October of last year, the company announced that it's working with United Launch Alliance to get a B330 into orbit around the moon by 2022. Also today, Bigelow announced that BSO has established a partnership with the Center for the Advancement of Science in Space, which manages the ISS U.S. National Laboratory. "With larger commercial platforms on the horizon, BSO recognizes the importance of gaining experience on the ISS," BSO representatives said in a statement. "Through this experience, BSO leadership hopes to gain a better knowledge of current and future customer needs on orbit as they pertain to larger-scale operations that are both science and non-science-related that cannot be handled by the ISS."